Good morning! I’m so glad to be back to crafting again! Other than a little crafting one evening when we were in the hospital (thank goodness I packed a crafting bag just in case — by the end of our hospital stay, we were so bored), I haven’t been able to craft at all. Today I’m jumping back in with a monochromatic card for this week’s Stamp, Ink, Paper Challenge. Make sure to check out the other design team cards and play along! I rarely do monochromatic cards — I always think in terms of color combinations, so I forget to do something as simple as combining different greens or blues or oranges. So I enjoyed creating for this challenge. Stampin’ Up! released a second group of three Sale-A-Bration freebies this week, and I’m totally in love! I am using the Painted Seasons stamp set. 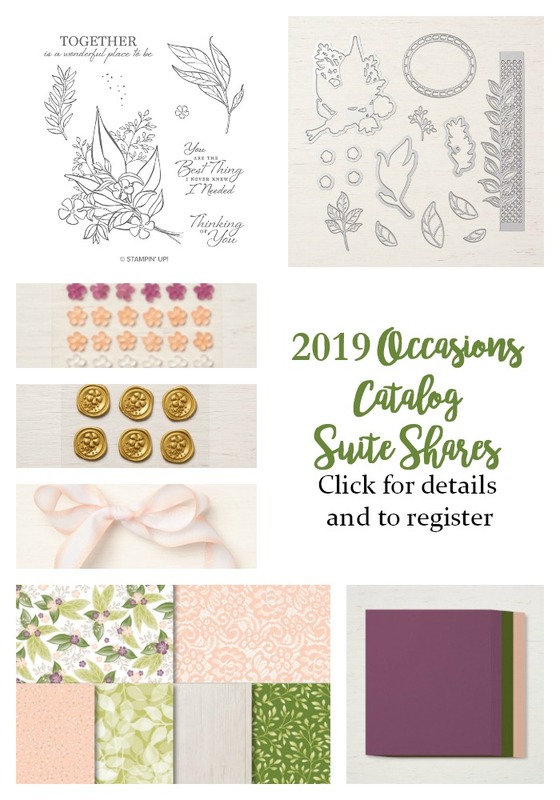 This set comes in a bundle with the Painted Seasons designer series paper, and you can earn it for FREE with a $100 purchase now until the end of Sale-A-Bration, while supplies last. The Painted Seasons stamp set is a DistINKtive stamp set, and it is probably my favorite DistINKtive stamp set ever. The images in the stamps are so beautiful. 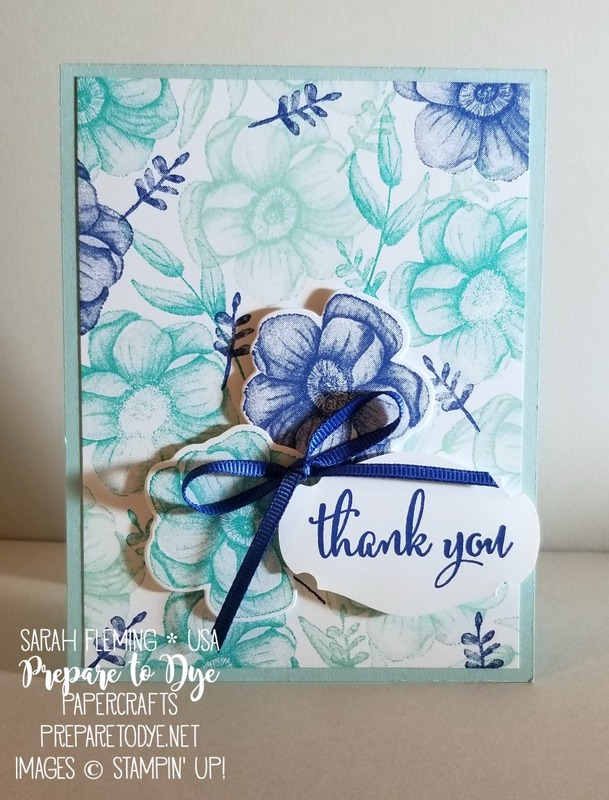 Here I stamped the biggest flower and two of the leafy branches in Pool Party, Bermuda Bay, and Blueberry Bushel to make my own background paper. Aren’t the stamps stunning? After I stamped the background on Whisper White cardstock (4″ x 5-1/4″), I mounted the background on a Pool Party card base (4-1/4″ x 5-1/2″). 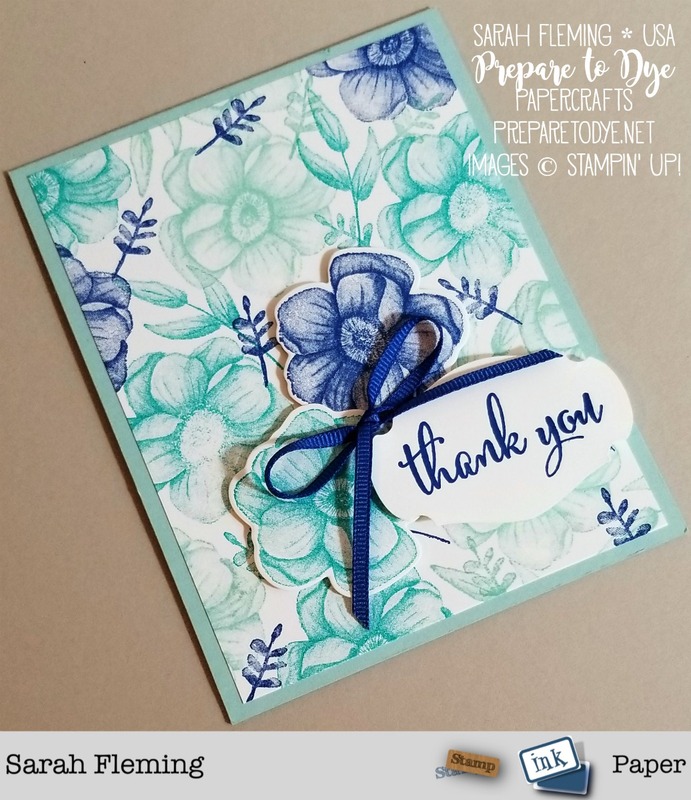 I stamped two more flowers in Blueberry Bushel and Bermuda Bay ink, then cut them out with the matching Four Seasons framelits. These framelits are LIMITED TIME dies that will be available March 1 – March 31 during the Sale-A-Bration Coordination promotion. I mounted both of the flowers on Dimensionals. I stamped the sentiment, from the Love What You Do stamp set, in Blueberry Bushel, then punched it out with the Story Label punch. This is a new punch that will also be available March 1 – March 31 for a limited time. I mounted the label on Dimensionals (double stacking the Dimensionals anywhere that the label doesn’t overlap the flowers). I finished the card off with a bow made from the Blueberry Bushel 1/8″ Grosgrain Ribbon. Thanks for stopping by! 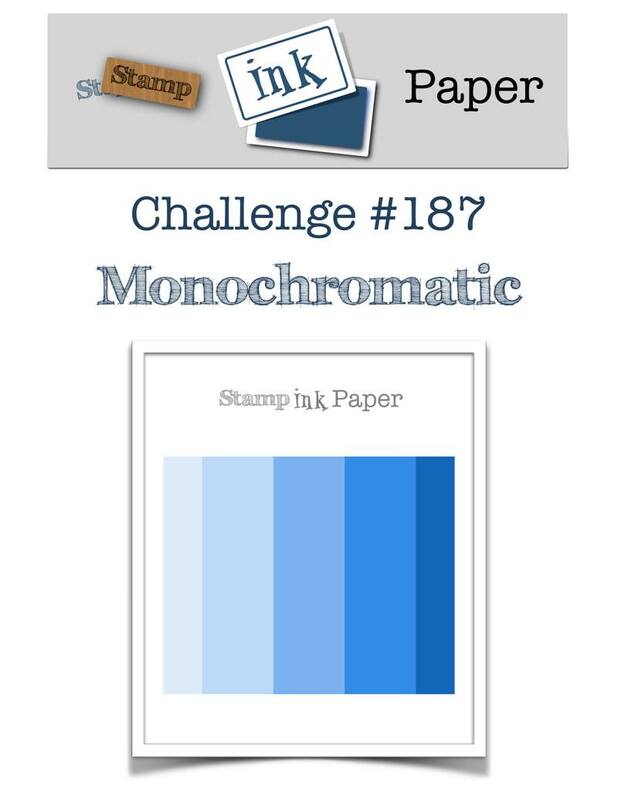 I hope you’ll pop over to the Stamp, Ink, Paper blog to check out the challenge and play along! We love to see what you create. Everything I used on my card can be found in my online Stampin’ Up! store (see full supply list at the bottom of this post). 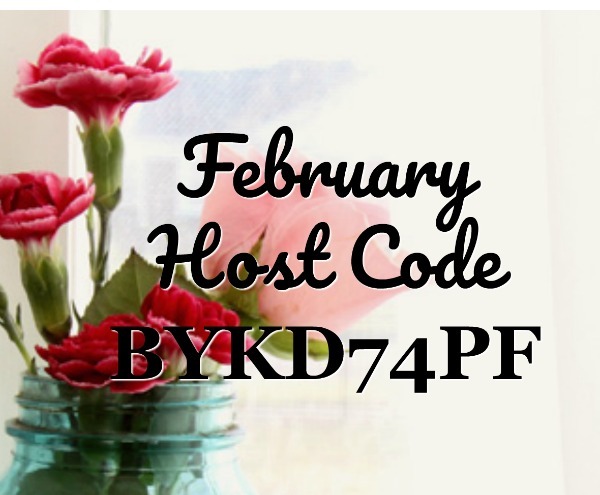 Make sure to use the February Host Code (below) if your order is below $150, and I’ll send you extra goodies! If your order is over $150, don’t use the Host Code — make sure to claim your Stampin’ Rewards when you check out, and you’ll still get my free gift! Register now for my January/February Online Class — Beauty Abounds! Click the graphic below for details and to register. If your shopping list is long, the Starter Kit is a great option for you! Click the button below to join my team and take advantage of the demonstrator discount until at least the end of July. You can sign up just for the Starter Kit deal or the demonstrator discount or to build your own business — it’s your choice!